This book highlights recent compelling research results and trends in various aspects of contemporary mathematics, emphasizing applicabilitions to real-world situations. The chapters present exciting new findings and developments in situations where mathematical rigor is combined with common sense. A multi-disciplinary approach, both within each chapter and in the volume as a whole, leads to practical insights that may result in a more synthetic understanding of specific global issues as well as their possible solutions. The volume will be of interest not only to experts in mathematics, but also to graduate students, scientists, and practitioners from other fields including physics, biology, geology, management, and medicine. Illustrations note 1 Tables, color; 22 Tables, black and white; 68 Illustrations, color; 27 Illustrations, black and white; XII, 371 p. 95 illus., 68 illus. in color. ​​This book highlights recent compelling research results and trends in various aspects of contemporary mathematics, emphasizing applications to real-world situations. The chapters present exciting new findings and developments in situations where mathematical rigor is combined with common sense. A multi-disciplinary approach, both within each chapter and in the volume as a whole, leads to practical insights that may result in a more synthetic understanding of specific global issues--as well as their possible solutions. The volume will be of interest not only to experts in mathematics, but also to graduate students, scientists, and practitioners from other fields including physics, biology, geology, management, and medicine. A. Antipin and O. Vasilieva, Augmented Lagrangian method for optimal control problems.- D. Fortin and I. Tseveendorj, Minimizing sign changes rowwise; Consecutive ones Property and beyond.- B.D. Annin, V.A. Kovtunenko, and V.M. Sadovskii, Variational and Hemivariational Inequalities in Mechanics of Elastoplastic, Granular Media, and Quasibrittle Cracks.- I. Diakite and B.M. Chen-Charpentier, Effects of a discrete time delay on an HIV pandemic.- R.A. De la cruz Guerrero and J.C. Juajibioy, On the Riemann problem for a hyperbolic system of Temple class.- P.C. Tintinago-Ruiz, L.D. Restrepo-Alape, and E. Gonzalez-Olivares, Consequences of weak Allee effect in a Leslie-Gower type predator-prey model with a generalized Holling type III functional response.- J. Arango and J. Delgado, Critical points of solutions to elliptic equations in planar domains with corners.- C. Autenried and M. Godoy Molina, Sub-Riemannian geodesics in the octonionic H-type group.- G.L. Mazzieri, R.D. Spies, and K.G. Temperini, Regularization of inverse ill-posed problems with L2-BV penalizers and applications to signal restoration.- C.D. Acosta, P.A. Amador, and C.E. Mejia, Stability analysis of a finite difference scheme for a nonlinear time fractional convection diffusion equation.- V. Kreinovich, Dealing with Uncertainties in Computing: from Probabilistic and Interval Uncertainty to Combination of Different Types of Uncertainty.- E. Ponce, J. Ros and E. Vela, A unified approach to piecewise linear Hopf and Hopf-Pitchfork bifurcations.- S.A. Vargas, T.S. Zhang, and R. Akhavan-Tabatabaei, Optimal decision making for breast cancer treatment in the presence of cancer regression and type II error in mammography results.- A. Morinaga, M. Svinin, and M. Yamamoto, On the Iterative Steering of a Rolling Robot Actuated by Internal Rotors.- C. Gonzalez and M. Paluszny, Odontological information along cone splines.- R. Assar, A. Maass, J. Fernandez, E. Kofman, and M.A. Montecino, Modeling cell decisions in bone formation.- J.M. Cordovez and C. Sanabria, Biodiversity and its role on diseases transmission cycles.- C.A. Trujillo-Salazar and H.D. Toro-Zapata, Simulation model for AIDS dynamics and optimal control through antiviral treatment.- J. Soliz and D. Molano, Orbital relative movement applied the formation flight of artificial satellites around the Earth.- D. Molano and L. Castaneda, Some mathematical aspects in the expanding universe.- P.B. Acosta-Humanez and E. Suazo, Liouvillian propagators and degenerate parametric amplification with time-dependent pump amplitude and phase.- L. Thompson, A.A. Velasco, and V. Kreinovich, Construction of Shear Wave Models by Applying Multi-Objective Optimization to Multiple Geophysical Data Sets.- F. Guerra-Vazquez and J.J. Ruckmann, Multiobjective semi-infinite optimization: convexification and properly efficient points.- J. Valencia, G. Olivar Tost, C.J. 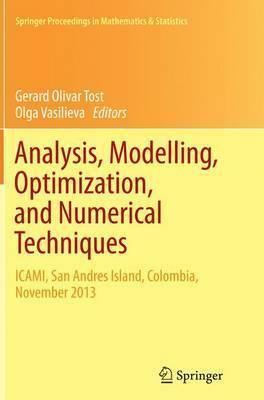 Franco, and Isaac Dyner, Qualitative Analysis of Climate Seasonality Effects in a Model of National Electricity Market.- M. Mesa, J. Valencia, and G. Olivar Tost, Numerical Simulation Analysis of a Traffic Model.